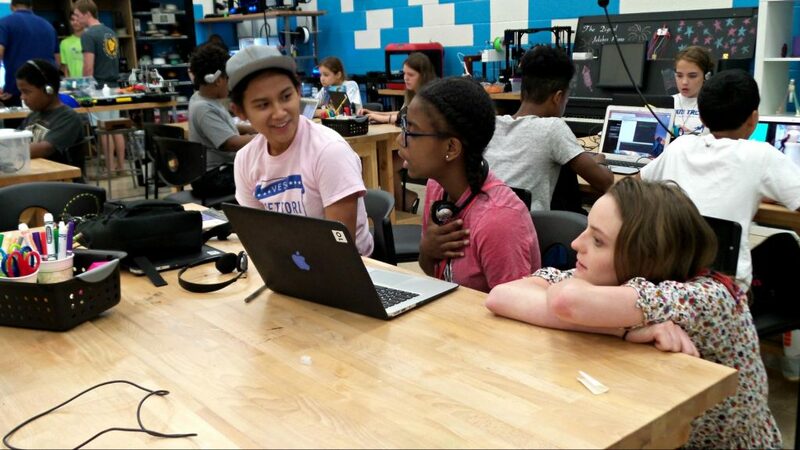 At the beginning of the fall season, the Makerettes, DHF’s all female maker club, began plans for a collaborative community project. 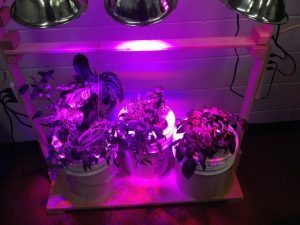 The basic framework of their plan was to involve the community in an ongoing project. At first, this simply involved creating an outdoor exhibition, but the Makerettes decided that they wanted to provide a more personal benefit. 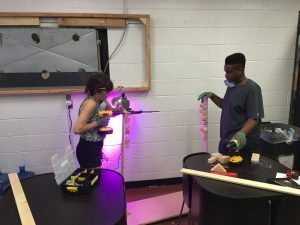 They decided that they wanted to create a fundraiser for another organization providing value to marginalized people in Baltimore. The initiative set forth by the Makerettes was to design and fabricate intricate tea light lanterns that could be displayed in the courtyard and sold online. All of the proceeds would be donated to the House of Ruth, a domestic violence shelter for women and children in Maryland. 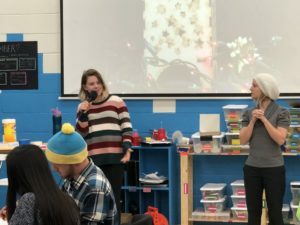 “Especially during the holiday season, the Makerettes wanted to make something for people other than themselves,” said Makerette, Sydney Lane-Ryer, at the Be the Light launch event on Wednesday, December 13th. The House of Ruth was the Makerettes’ chosen charitable organization because of the work it does for women in the Baltimore region. As a female-founded and operated club, the Makerettes wanted to show solidarity with another female-focused organization. 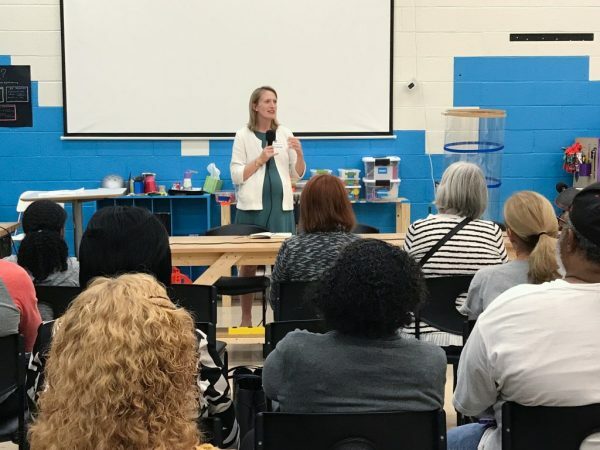 Volunteers from the House of Ruth also attended the Be the Light event where they raised awareness about domestic violence and the work being done by the House of Ruth. Nearly fifty lanterns were sold at the Be the Light launch event, which raised more than $500 for the House of Ruth. The lanterns that were donated to DHF will be displayed in the courtyard as part of the Be The Light Installation on display at our 5th Anniversary Showcase on January 18th. Lanterns will be on sale at that event, but you can also purchase lanterns now by visiting: dhf.io/lanternkit. 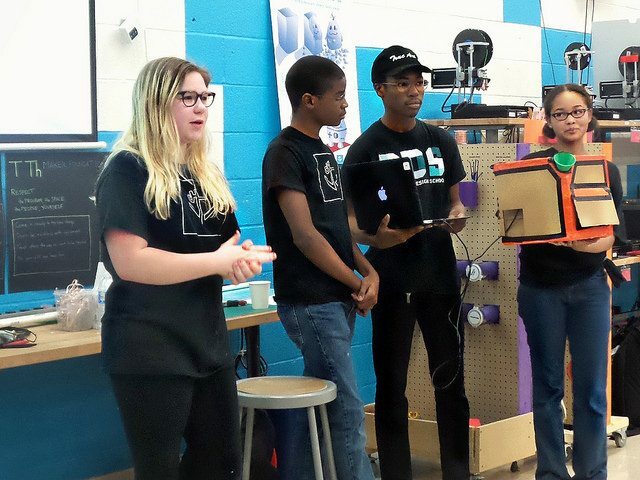 The group of youth that started with Sierra that fall comprised DHF’s first Maker Foundations cohort. There were sixteen youth in the cohort, only three of which were female. “Me, Steph, and Amber [DHF’s Director of Education and Operations Manager, respectively] wanted to try to increase female retention in programs and sat down to brainstorm different ideas,” Sierra said, “I knew that I had stayed as long as I did because I’d formed a bond with Steph and wanted to find opportunities for other girls to collaborate with staff.” These preliminary meetings led to the formation of the Makerettes, a group of female youth and staff at DHF who meet twice monthly to collaborate on a variety of different projects. 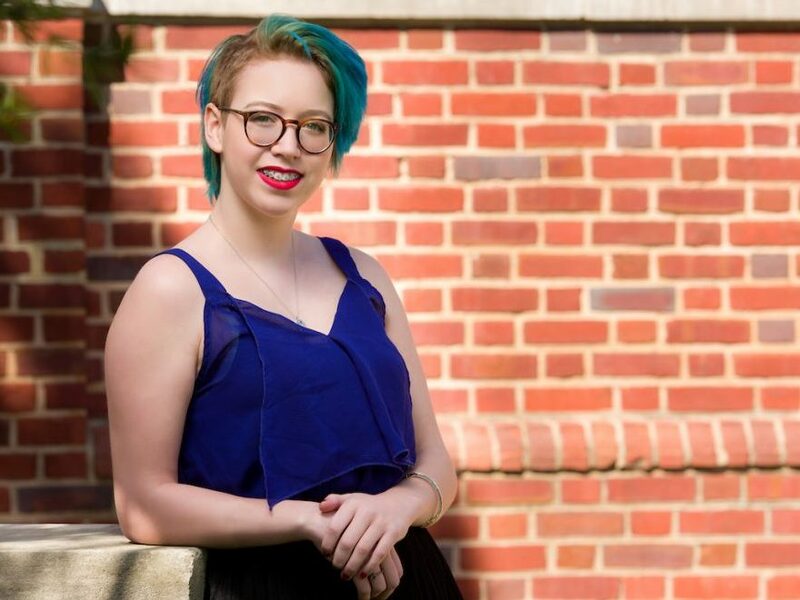 “I fell off one summer because I was going through some transitional changes in my life and it was hard to come in and do something without knowing what to do,” said Sierra. The Makerettes were a support system that guided Sierra and other girls as they explored different projects. 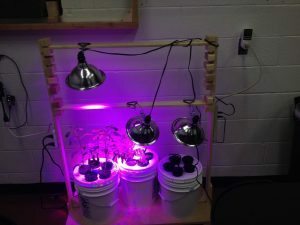 Many of the projects Sierra created have become long-term installations at DHF. 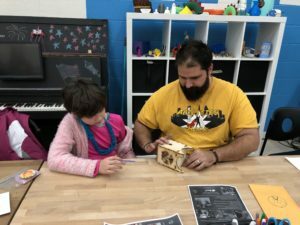 When Sierra became a Member at DHF, she started working on other projects with CNC machine and 3D printing photographs. 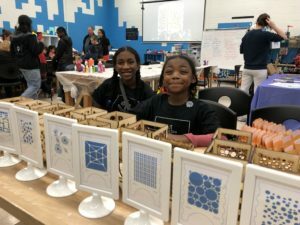 She also built a photobooth and created an egg bot – a robot that draws on small round objects such as ping pong balls, light bulbs, and eggs. Her jukebox piano, too, went through several different iterations. 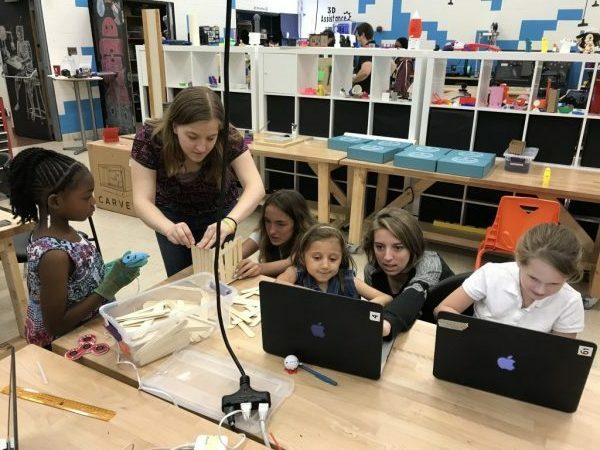 Women today are often faced with the challenge of being largely underrepresented in the tech world, but at DHF, in contrast, women represent around 40% of participants in programs semester to semester. 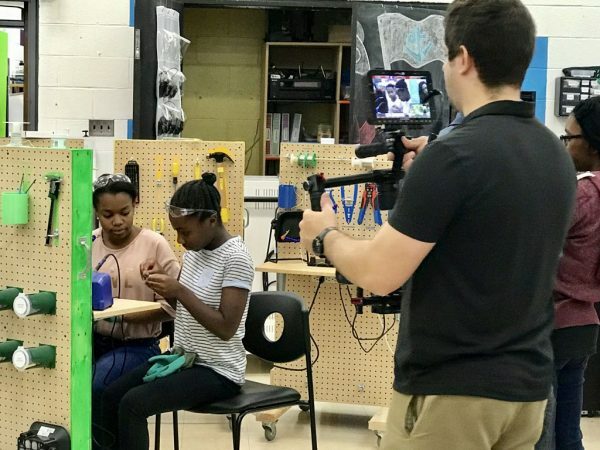 In an effort to give girls a platform in STEM, the young women of DHF partnered with Wide Angle Youth Media at the end of August to create a short film for the United Nations’ International Day of the Girl Child initiative that showcases young women of different ages and demographics making in collaboration. 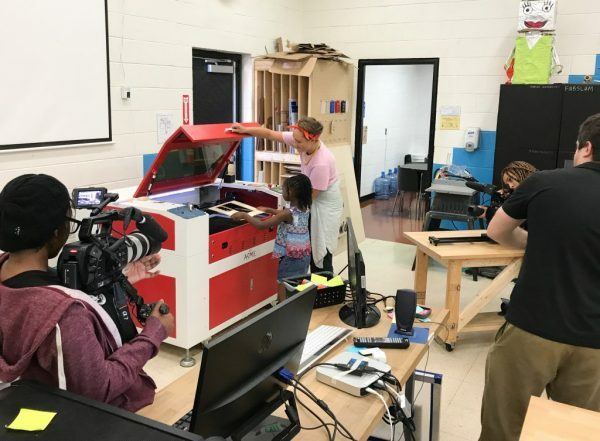 The film screening, which also began DHF’s social media campaign for female youth’s representation in makerspaces and tech spaces, features DHF youth Miranda Hull, Jordyn Bocklage, Elizabeth Blake, Madison Bannerman, and Aeirss Prince, Anna Miller, Samantha Nistico, and Alexis Leggette. 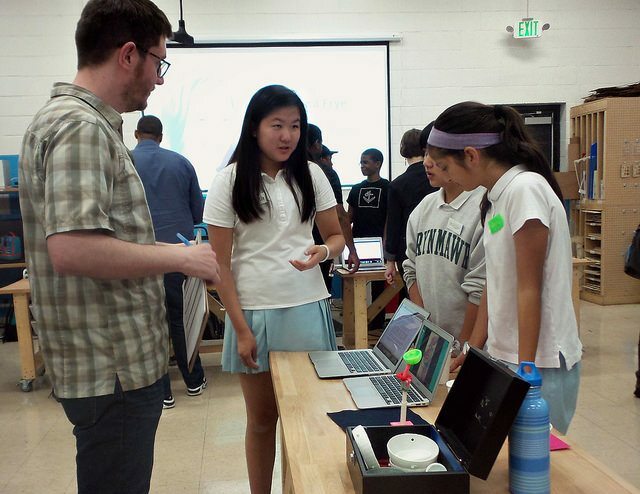 It shows the girls engaging in activities, such as problem solving, programming, laser cutting, and soldering, and features an encouraging message to girls – although only 24% of employees in math, science, technology, and engineering are women, young women can change this statistic by working together and rejecting the stereotypes that their minds aren’t wired for math and science. Before and after the screening, two panels of DHF’s actresses answered questions posed to them about the process of creating the film and their experiences as young women in tech. 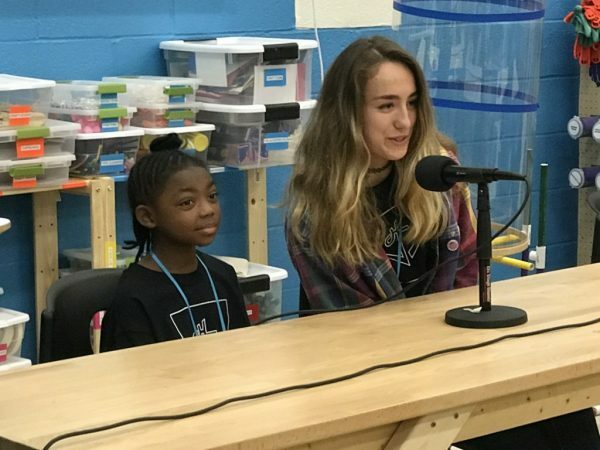 When asked how to get more girls involved in tech, Aeirss, who narrates the short film, said “I would encourage girls to just go out and do it.” She also shared her story of being the only female participant in her school’s robotics club. Miranda had a similar experience of being one of the few females involved in her school’s Science Olympiad program. Watch, like, and share this video to show your support for girls in STEM! 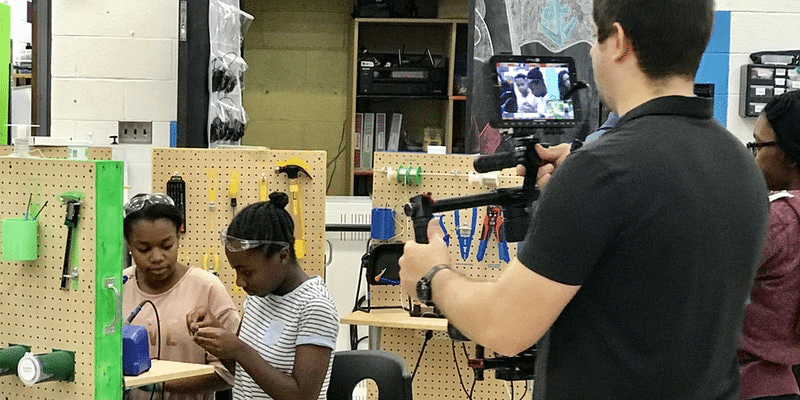 This year, the girls at Digital Harbor Foundation joined with youth at Wide Angle Youth Media to deliver a simple message: the world needs girls in Science, Technology, Engineering, and Math (STEM). They reject stereotypes that boys are naturally better at these subjects than girls, that boys work harder in school, and that girls simply are not meant to go into STEM careers. They embrace the importance of diversity in today’s global workforce. They know that girls across the world are working together to create the future. 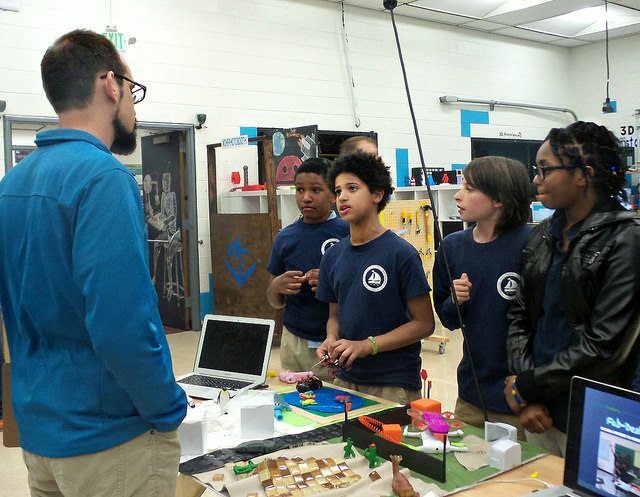 Want to learn more about how Digital Harbor Foundation is bringing technology education to Baltimore’s youth, regardless of age, background, gender, race, or ability to pay? 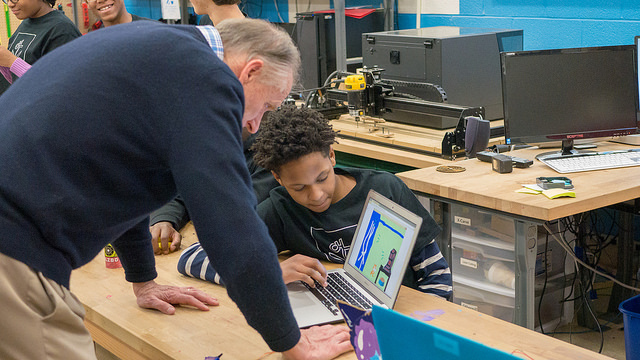 Are you an educator interested in incorporating technology into your learning environment? 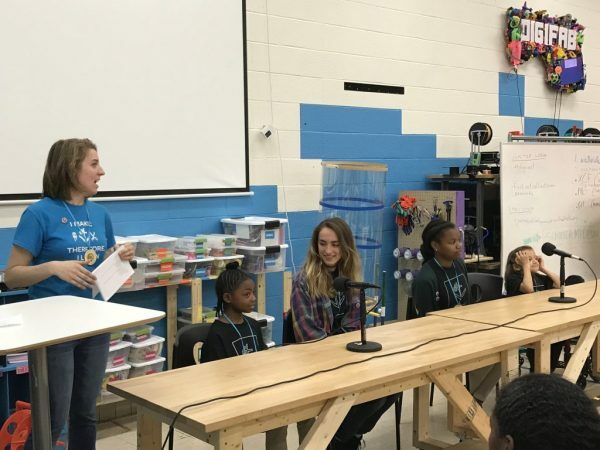 Want to learn more about Day of the Girl or how to encourage gender and racial diversity in STEM? 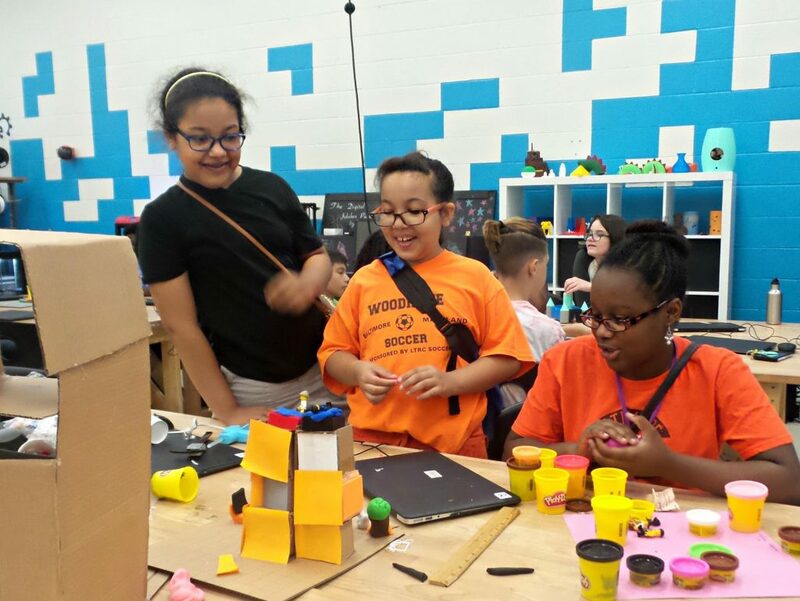 MakerEd: By enabling educators to use maker education—with a particular focus on those in underserved communities—we believe Maker Ed can help them transform their learning environments, and together we can reach thousands of youth of all ages, backgrounds, and abilities. 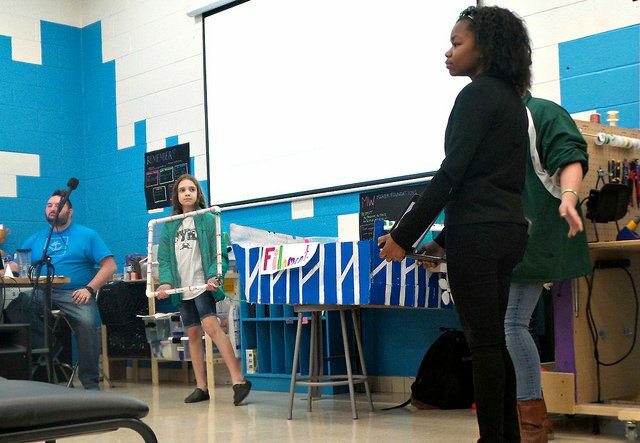 In February, DHF youth member, Bella, approached our Youth Steering Committee with an idea to have a Youth Hackathon. The hackathon would be organized and hosted by the Youth Steering Committee and open to youth in the Baltimore area ages 12 to 18. The idea of the hackathon would be to create a space for youth the experience the environment of a hackathon alongside their peers. 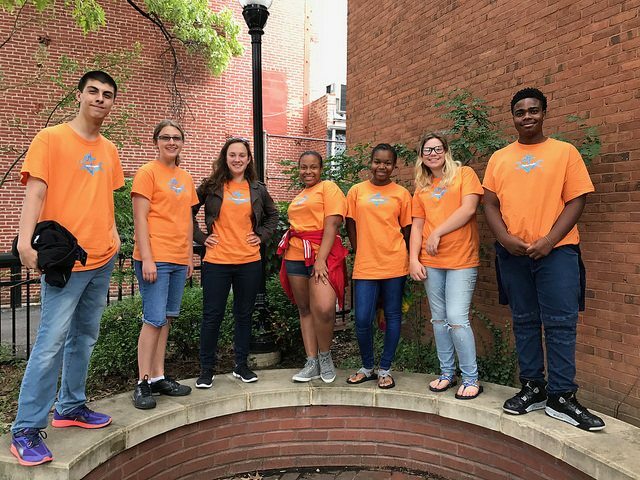 Over the next seven months, the Youth Steering Committee split into groups to organize the hackathon – Harbor Hacks – a task that involved securing sponsors, creating a budget and ordering prizes, and recruitment of hackers, coaches, and judges. All their planning came together the weekend of August 11th. 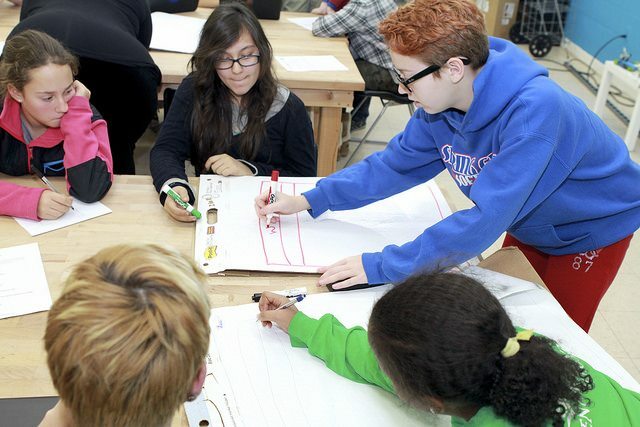 Forty youth split into ten groups to begin work on a variety of hardware and software projects. We were excited to have a large representation of female participants (46%!!) and youth new to DHF (36%). 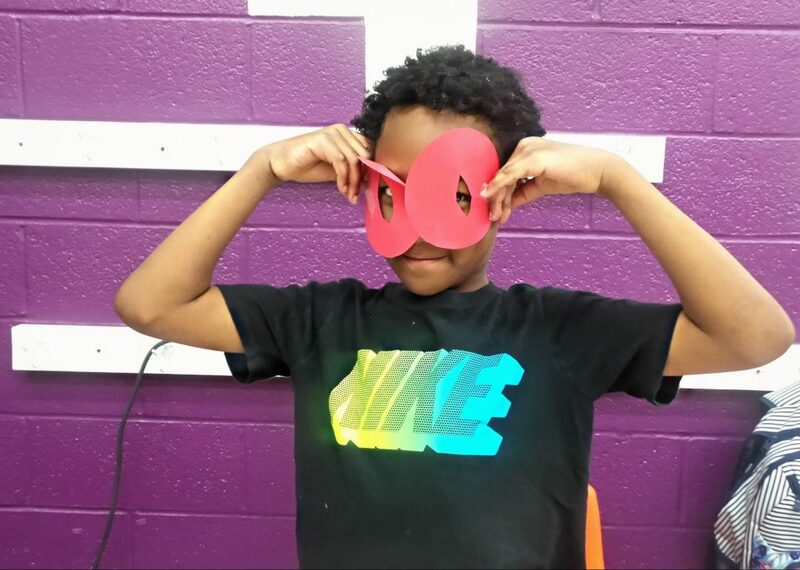 Aside from their project work throughout the weekend, the youth also participated in soldering workshops with the SparkFun Weevil Eye Kits and programming workshops with Micro:bits, both items that each youth received as part of their swag bags. 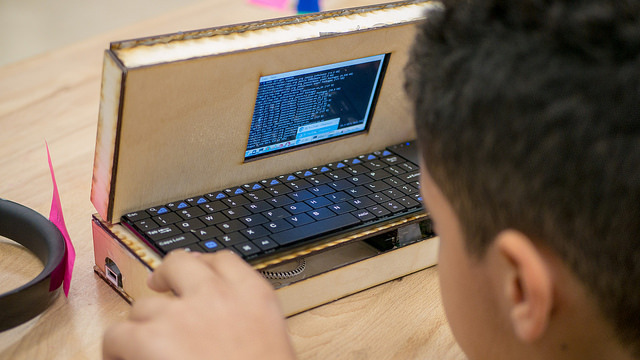 The criteria for judging included difficulty and challenge, communication, functionality, presentation, and innovation in two categories: hardware and software. 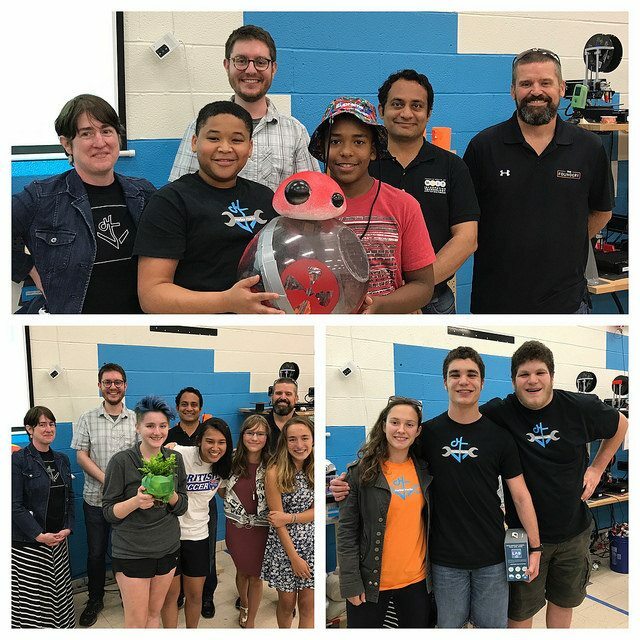 We had a talented group of judges including Ellie Mitchell (Maryland Out of School Time Network), Marty McGuire (web developer & Baltimore Maker), Jason Hardebeck (The Foundery), and Vakul More (Baltimore Mayor’s Office of Information Technology). Their job was definitely not an easy one! 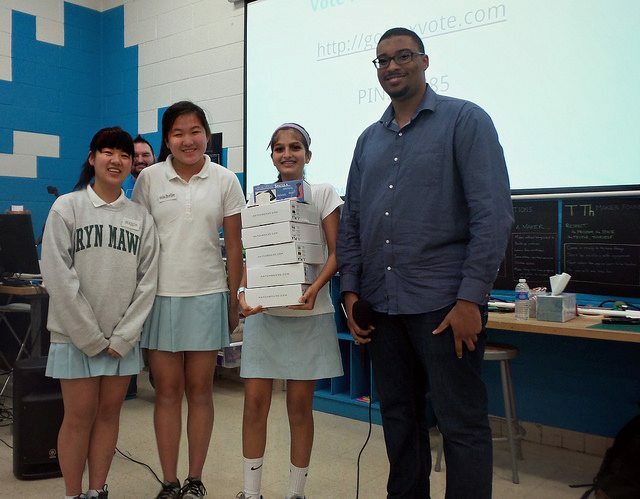 All of the projects were great, but ultimately, the judges selected the winners: the winners of the HARDWARE prize were Jean Carlos Zayas and Kaire Williams for their creation of a BB8 robot and the winners of the SOFTWARE prize were Maya Gaylord, Miranda Hull, Carrie Couch, and Liza Molotska for their interactive scratch game, Samventures. The judges expressed being most impressed with the winners’ clear vision and intention to continue the efforts of their teams beyond the hackathon. 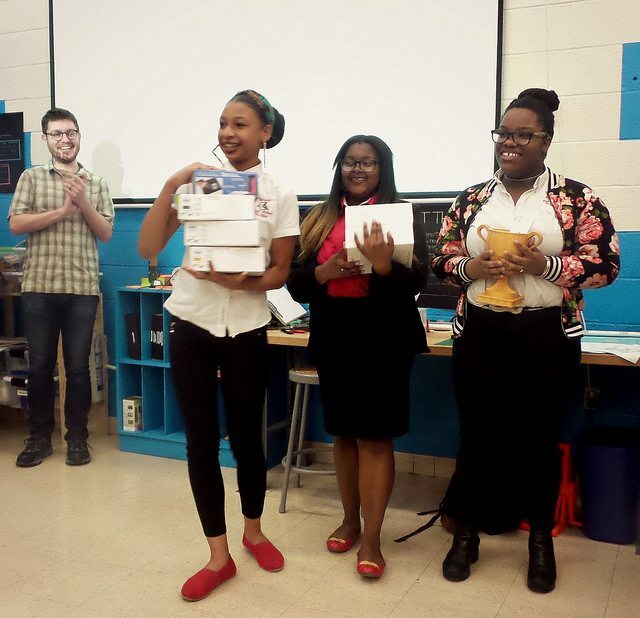 The youth in attendance at the hackathon also selected a HACKERS CHOICE winner – Dorian Smith and Ian Smith were selected for their creation of a website through which food suppliers and producers could donate surplus food items to people and organizations in need. “I would tell other youth that if you go [to the hackathon] you will have the best time of your life.”To see more from the weekend, check out our Harbor Hacks 2017 Album on Flickr. 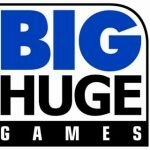 Thank you, again, to our generous sponsors for Harbor Hacks 2017! It’s hard to believe that we are reaching the conclusion of another busy summer at DHF. 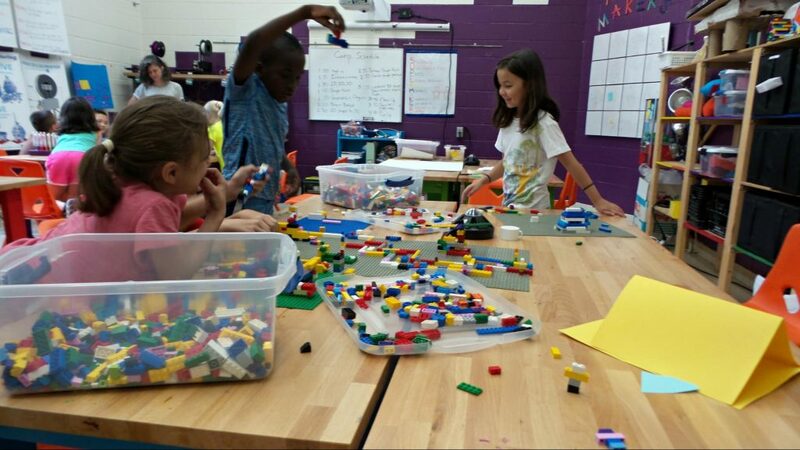 This summer we had 3 cycles of Maker Camp for Mid-High students and Elementary students and 3 cycles of Member camps. 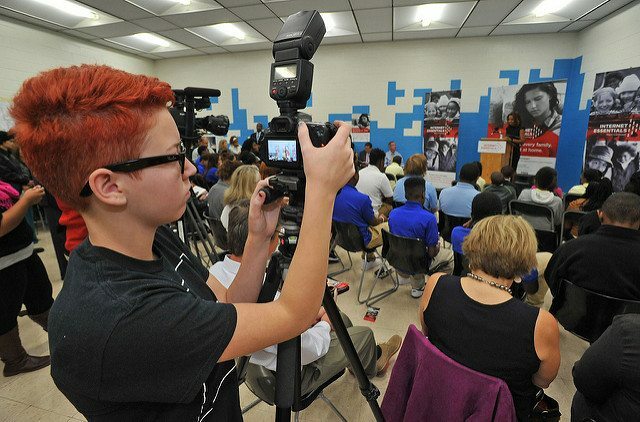 These camps ran concurrently with our YouthWorks program and many of the youth involved in YouthWorks helped facilitate programming for the camps. 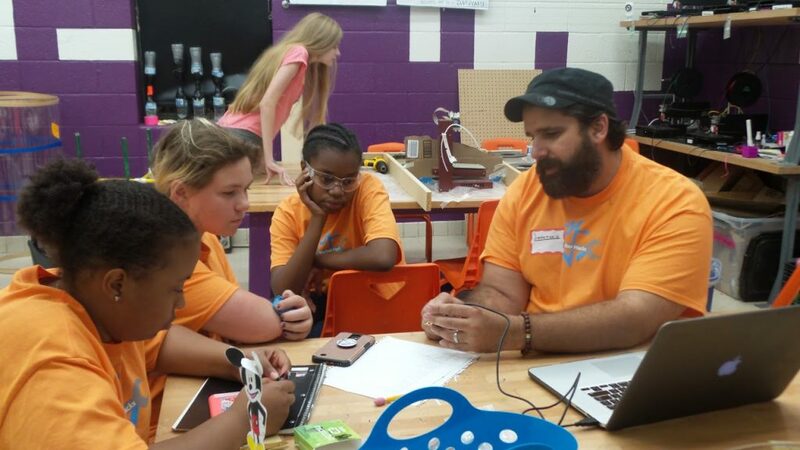 The summer concluded with DHF’s inaugural youth hackathon, Harbor Hacks. 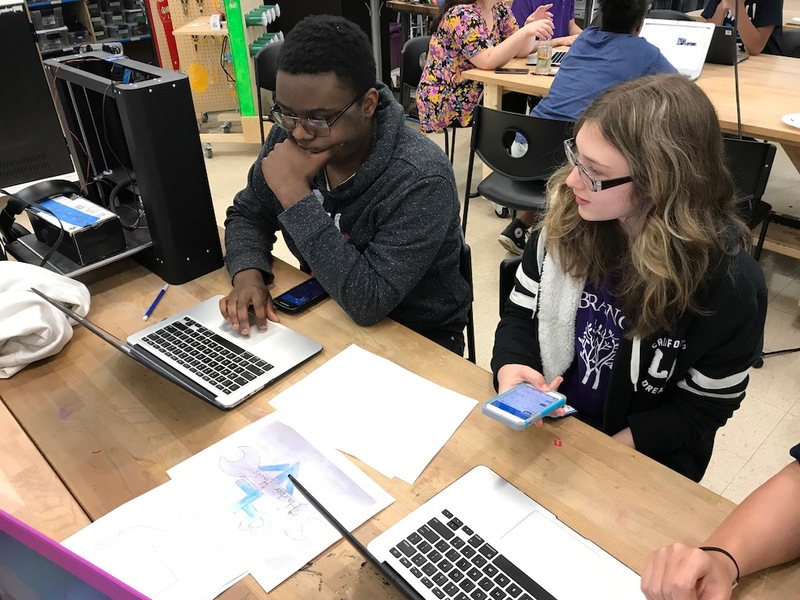 We wrapped up the summer with the Harbor Hacks youth hackathon proposed by DHF member, Bella Palumbi. 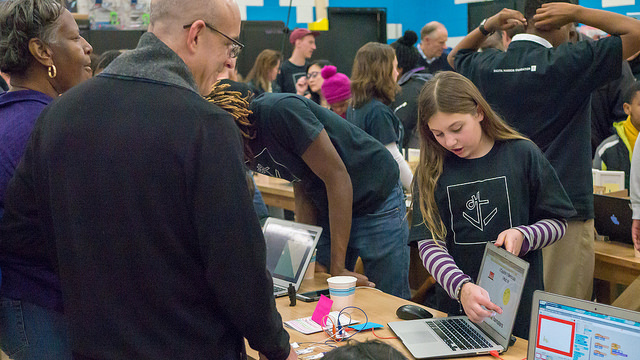 The hackathon was attended by 40 youth, 14 of which were non-regular program participants. The event was a perfect cap to the summer with the productivity of the past three months channeled into 3 days of innovative brainstorming, hacking, and presentation. 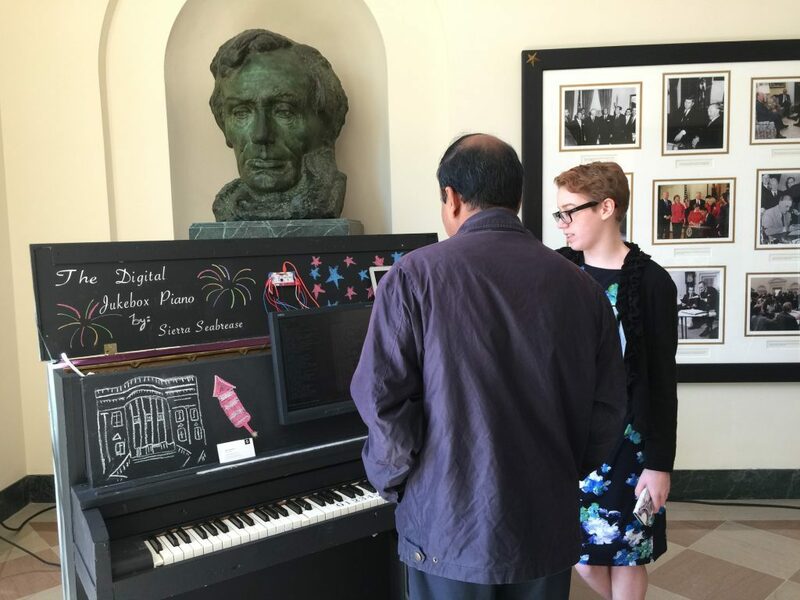 After participating in several local hackathons, one DHF youth, Bella, noticed that something was missing from these events. 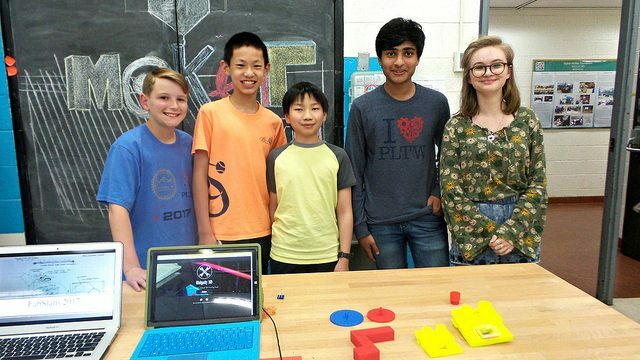 Where were all the young makers? Bella thought that many youth may not be participating in community hackathons because they might not know what to expect at a hackathon. 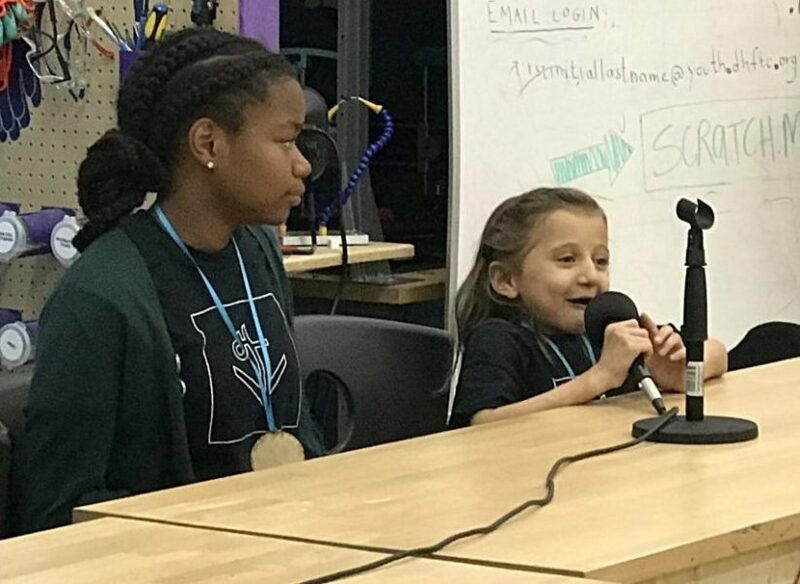 She remembered back to her first hackathon and how her Mom had to keep encouraging her to attend because she was so nervous, she even wanted to back out briefly during the walk to the space. Now, Bella participates in numerous hackathons (and has won a few!) 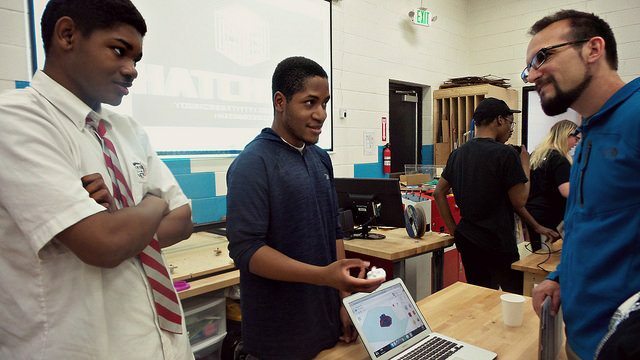 all over Baltimore and came up with an idea to create a hackathon just for youth. This would give young people new to the idea or concept of a hackathon a safe place to experience a hackathon that was designed just for them. In February, Bella presented her idea for a Youth Hackathon to the Youth Steering Committee at DHF. Our youth split into different committees for the event and went to work planning. 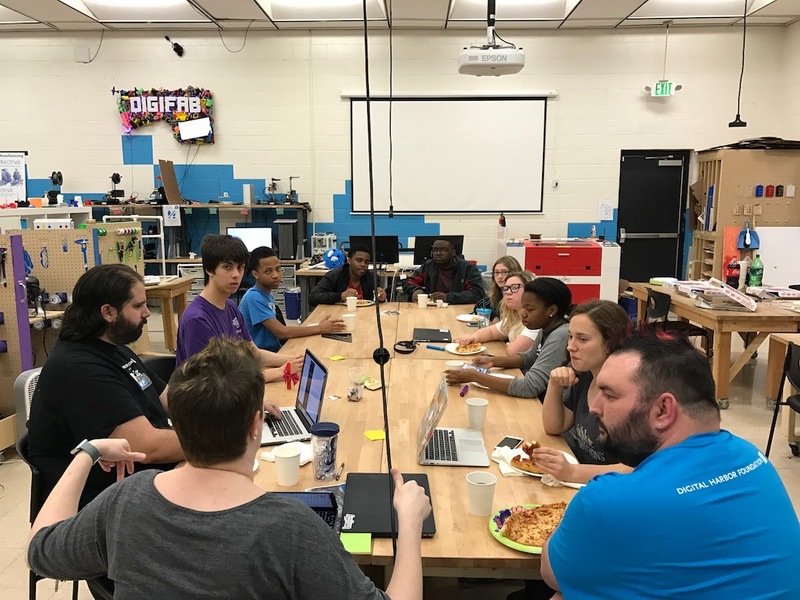 Their hard work will be a reality next weekend August 11th – 13th at DHF when the inaugural Harbor Hacks Youth Hackathon takes place. Any youth between the ages of 12 – 18 who like to solve problems, create new inventions, or dream big! Hurry, registration ends August 7th. We are also looking for a few adult tech coaches to help teams out throughout the weekend, so if you think you might be a good fit, get a coach ticket. Registration for students is Pay-What-You-Can and includes a weekend of fun, a t-shirt, meals and snacks all weekend, and some awesome giveaways! Yes! Awesome tech prizes are waiting for the teams or individuals who impress the judges. We hope you will be able to join us for a fun weekend! Last week, DHF hosted our 6th FabSLAM Showcase as the culminating event for this cycle of the annual digital fabrication challenge. 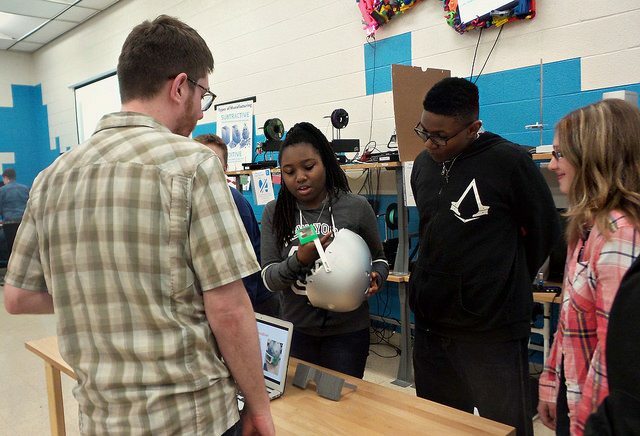 This year, during FabSLAM, Baltimore-area youth were prompted to identify a problem they might encounter using any form of transportation and then use digital fabrication methods, like 3D printing or laser cutting, to create a solution. 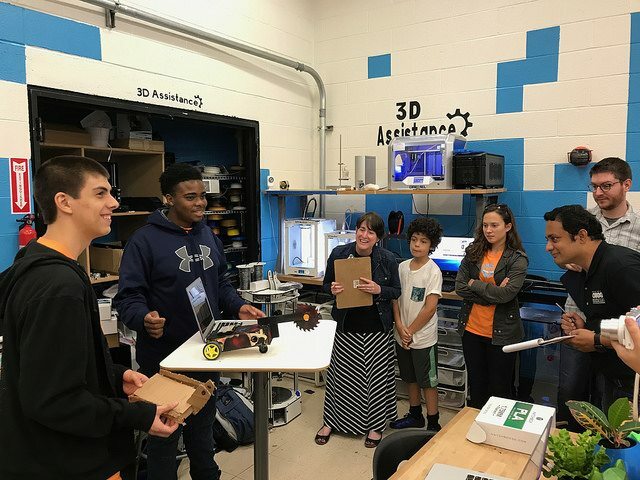 On May 4th, 10 teams of youth in grades 5-11 from Baltimore and DC gathered at the DHF Tech Center to showcase their work to judges and each other. The finale showcase for FabSLAM is always exciting and inspiring and this year proved to be more of the same. Teams arrived ready to share their work with our equally enthusiastic team of judges who have the difficult task of selecting winners. 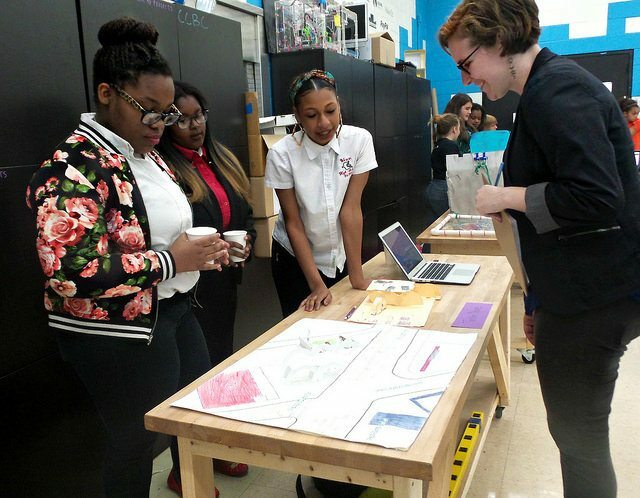 Our First Place prize was awarded to the Western High School TinkerDoves, for their high-tech bus stop design of improvements that could be made to the Penn North stop in Baltimore City. 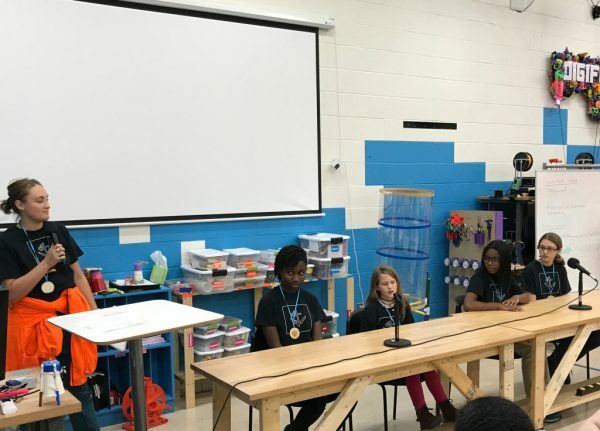 The judges were very impressed by their proposed solution to a hyper-local problem and one that they encounter on a daily basis on their commute to and from school. Judges awarded Third Place to a DHF team, The Filamentors, for their Trash Collection Boat. 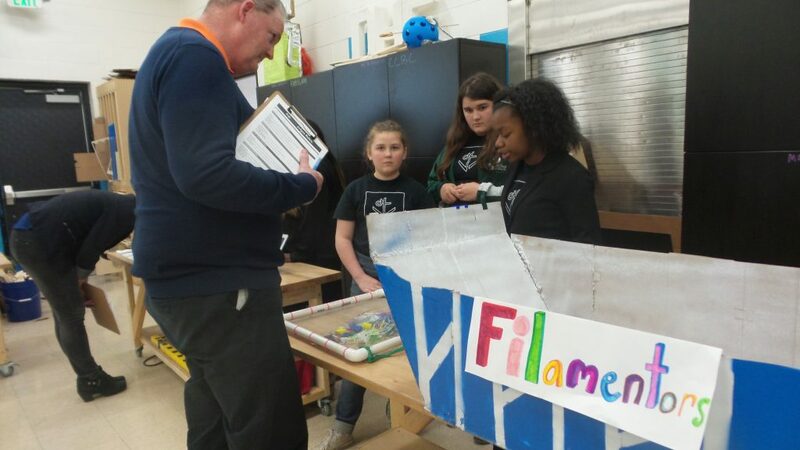 The goal of their solution was to attach a fabricated net contraption to boats that are already traveling in the harbor to collect more trash. 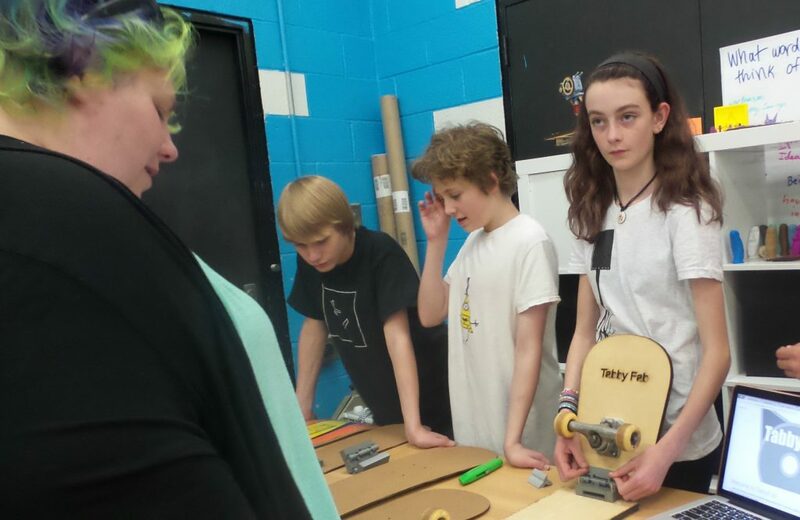 Team Tabby Fab won the Fan Favorite vote from the audience for their Foldable Skateboard that they laser cut for easy storage in a backpack. A giant thank you goes out to our 2017 panel of Judges, without whom we could not run this program! We were honored to have so many judges representing many facets of a variety of industries. In addition to our awesome panel of judges and enthusiastic teams, we are also grateful for our FabSLAM 2017 Sponsors who provided prizes for the teams! 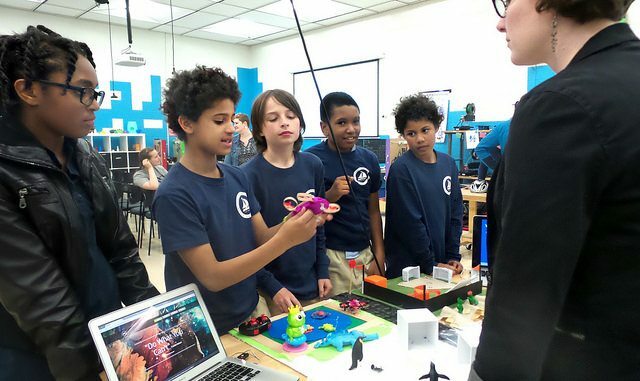 Thank you to MatterHackers, Hatchbox, BuildTak, LulzBot, DHF Print Shop, Direct Dimensions, and The Foundery for the generous donations of products, materials, and experiences that were awarded to all our teams.